Bike rentals Lago Trasimeno. Let Cycle Classic Tours arrange your road bike rentals or e bike hire before you start with your cycling holiday in Italy. Book your road bikes or e bike hire online, its easy and convenient. Lago Trasimeno is a lake in the province of Perugia, in the Umbria region of Italy. A cycling trip around the lake is 70,5 kilometres. The trip offers many great climbs and spectacular views over the lake. The lake is nestled between the rolling hills of Umbria. The hills are covered with olive groves and beautiful medieval buildings. Inland you will find old castles, cosy towns and charming villages. The roads are perfectly paved and almost free from traffic. The rolling landscapes of Umbria are perfect for all cyclists. The sunny climate and beautiful nature makes Umbria of the best cycling regions in the world! 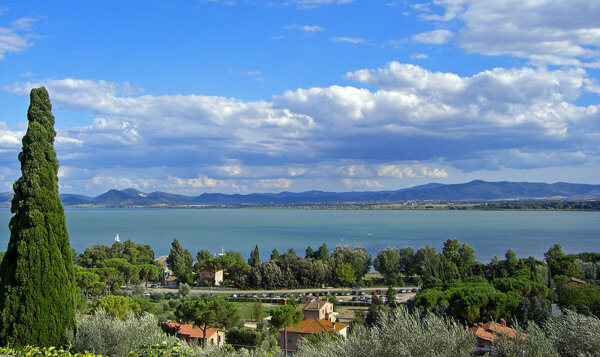 We wish you a pleasant cycling holiday in Lago Trasimeno.